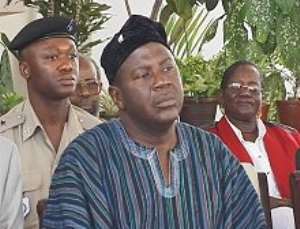 Accra, May 20, GNA - The Serious Fraud Office (SFO) has in five-paged statement, released to the Ghana News Agency on Thursday, denied the involvement of Vice President Aliu Mahama in the Kolon Affair, which led to the award of a total of $1,829,475.93 by London Arbitrators against the Government of Ghana. The SFO statement said: "The Chronicle" story - "Ghana's bogus $3.5m debt. Kolon agent misled Veep?" - suffered from the fallacy of anachronism. "The Chronicle" of Friday May 14 on its front-page story had alleged that Mr Patrick Adamah, a former employee of Kolon Company, a UK-based Korean Company, might have misled Vice President Mahama to intervene in the affair. The SFO said the Vice President was not involved in the transactions or resolution of the issue. The statement explained that "the transactions leading to the arbitration commenced in 1996 and 1997 and the arbitration itself commenced in March 1999. The first notification to the Ghana Government was in July 1999; the Government at the time appointed Masons, Solicitors in the UK to represent the Government. "Hearings in the arbitration commenced in June 2000; it is therefore difficult to see how the Vice President could have taken any action to influence the beginning of the dispute, which led to the arbitration." The SFO said when the new administration took office in January 2001; the arbitration was in progress, adding that the same team that represented the Government in 1999 continued with the case until it ended in March 2002. "Nobody in the new administration interfered in the proceedings," the statement stressed. Again for the records "the SFO states that none of the statements made in the article implying that the SFO had been lied to by Mr Adamah; the SFO had been recruited by Mr Adamah in any unholy agenda and SFO released information, which had been used against the State of Ghana are all completely and absolutely false". The SFO has, therefore, requested the Chronicle to "take steps to correct the false impressions created by the article to prevent the damage to the SFO and other personalities mentioned in connection with the SFO as both ethical and legal consideration demand."